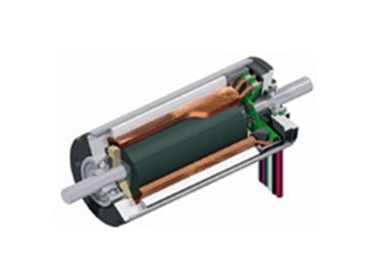 Maxon Motor have developed a new 30mm diameter power motor, focusing on customer orientation. At 200 watt output power, the EC-powermax is a good drive. The new optimised maxon winding technology gives it better performance benefits. The stator is grooveless, which means there is no detent, providing good control characteristics, particularly for positioning operations. It is also much quieter in the upper speed range, as there is less mechanical vibration. The 4-pole rotor is fitted with magnetic material, with the magnetic field scanned for electronic commutation. The motor design has been kept deliberately robust and promises to be highly reliable, even for the expected high currents. The increase in the motor’s characteristics which define a motor’s output capacity is 5.7 min-1mNm-1, i.e. four times better than the comparable 2-pole version. The motor can be combined in the modular system with 42mm planetary gearheads, digital encoders up to 1,000 pulse and brakes. The drives form a high-powered drive system in combination with electronic maxon controls type DES or a modern positioning system.